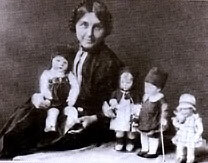 Käthe Kruse created her first doll in 1905 in Germany. Just like this first doll conquered the heart of Käthe Kruse´s daughter Maria, the Käthe Kruse dolls of today fascinate girls and boys of all ages. It became known there was a young mother in Berlin making play dolls for her children and in 1910, Käthe Kruse was asked to exhibit her handmade creations in Berlin´s department store Tietz. Her charming dolls were an overwhelming success. 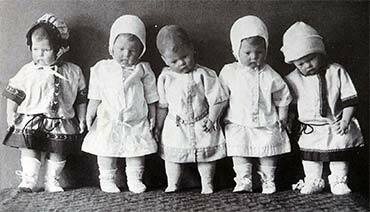 Dolls were not a new idea, but these didn´t look like little adults, they looked like children. Adults loved the dolls for their naiveté and children could identify with them. New York´s famous FAO Schwarz ordered the first 150 Käthe Kruse dolls in 1911. Käthe Kruse realized she could not continue to make her dolls in her living room and opened a factory in Bad Kösen, In the early years the factory was located in a small house on Friedrichstraße. In 1923 it moved to a former schoolhouse also on Friedrichstraße. The factories produced several doll models, clothing and accessories. In 1946 Käthe Kruse sent sons Max and Michael to the Western Zones to open two branch factories. Max began operations in Bad Pyrmont where he managed production of "Child of Fortune", a small and inexpensive play doll. Michael moved parts of the production to Donauwörth and in 1950 the entire production was moved there. The new factory in Donauwörth was managed by the Kruse children, Michael, Max and Hanne. By 1958, ownership of the company passed to Hanne Kruse-Adler. She was responsible for creative decisions while her husband managed the finances. Earlier, Hanne created her first doll, the Däumlinchen, which became a great success at the Nuremberg Toy Fair. In the mid-60's Hanne Kruse took the decisive step to begin making toys for babies and toddlers including soft terry cloth animals, play balls and a new doll family called "The Timmermans". Some of these cloth products are still made today! In 1990, Hanne Kruse handed the factory to a new generation. She found the perfect successors in Andrea and Stephen Christenson. 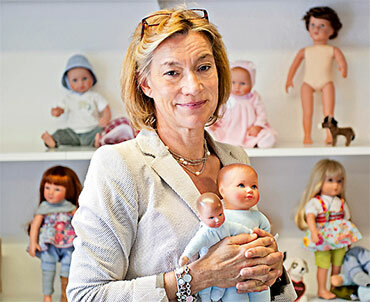 As a child, Andrea played with Käthe Kruse dolls and dreamt of owning the wonderful doll factory one day. Sticking to Käthe Kruse´s philosophy of handcraft and quality, the new owners have managed the factory according to their motto: "Die Tradition im Herzen, der Zukunft entgegen" - "With the tradition in our hearts, we move to the future". Today the German brand Käthe Kruse stands for dolls, toys, home accessories and children´s fashion, and represents innovation in toys for children and doll lovers of all ages. In 2013, Hape Holding AG announced it added Käthe Kruse Production and Distribution to its platform of children’s products. Hape is known as the world’s largest producer of toys made of sustainable materials. The collaboration joins together two experienced toy industry leaders. Peter Handstein, founder and CEO of Hape says, "I feel a responsibility to carry the heritage of Käthe Kruse forward,"
Käthe Kruse products are designed and made to last not only throughout childhood, but can last for generations. Respecting our company philosophy, Käthe Kruse does not mass-produce products but they are individually handmade, giving them their typical Kruse charm. Fabrication of all Käthe Kruse products takes place in Germany and Latvia at company owned and managed facilities.